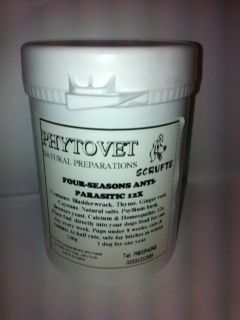 PhytoVetHerbal Four Seasons Anti-Parasitic - Herbal / Homeopathic parasite repellent for all Equines, Cats, Dogs, Ruminants, Camelids & Rabbits Four Seasons is a safe, natural liquid vermifuge, created using herbs along with homoeopathic tinctures. It works by creating a totally alien environment in the stomach(s), which adult endo-parasites cannot tolerate, this causes them to be rapidly expelled from the host. 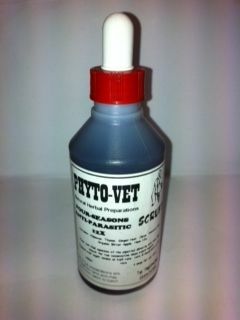 Click Here for more information on PhytoVetHerbal Anti-Parasitic 12x Tinctures. PhytoVetHerbal Four Seasons Anti-Parasitic - Herbal / Homeopathic parasite repellent for all Equines, Cats, Dogs, Ruminants, Camelids & Rabbits Four Seasons is a safe, natural powder, created using herbs along with homoeopathic tinctures. It works by creating a totally alien environment in the stomach(s), which adult endo-parasites cannot tolerate, this causes them to be rapidly expelled from the host. Click Here for more information on PhytoVetHerbal Anti-Parasitic 12x Powders.